The Benevolence theme features 14 custom widgets, all available to be placed in home page, sidebar and footer widget areas. The WPlook Address widget allows you to display the address and the contact details of your organisation. The WPlook Address widget in the sidebar. Title: The title of the widget, seen at the top of the widget. Organisation name: The blue header below the title. Address: The full address of your organisation. Can include line breaks. Phone: The contact phone number of your organisation, which will automatically be displayed as a link. Leave blank to hide. Email: The contact email address of your organisation, which will automatically be displayed as a link. Leave blank to hide. Website: The website URL of your organisation, which will automatically be displayed as a link. Leave blank to hide. The WPlook Causes widget is used to display a list of causes, with basic cause details, a donation link, and a link to view all causes. Category: The category from which the causes will be displayed. Number of Causes: The number of causes to display in this widget, sorted by date, with the most recent causes displayed first. URL to all Causes: The URL to a page listing all of your causes, for example one using the Causes Grid or Causes List templates. Will be used to display a link to the page next to the widget title. Leave empty to disable. Clear after? : Set to Yes if you want to add more widgets following this one in the same widget area. If this is the last widget in the widget area, set this to No. The WPlook Docs widget is used to display the latest documents. It displays basic information for every document, a link to the document, and a link to all documents. Category: The category from which the documents will be displayed. Number of docs: The number of documents to display in this widget, sorted by date, with the most recent documents displayed first. URL to all docs: The URL to a page listing all of your documents, for example one using the Documents Grid or Documents List templates. Will be used to display a link to the page next to the widget title. Leave empty to disable. The WPlook Events displays a dated list of your latest events (including repeats), together with a link to your upcoming events page and the events calendar. Category: The category from which the events will be displayed. Number of Events: The number of events to display in this widget, sorted by date, with the most recent events displayed first. Every repeat of a single event counts towards this, rather than every separate event. Event type: Choose whether to display Upcoming events or Past events. Duration in days: If the widget is displaying fewer events than the “Number of Events” value above, you can increase this value to look for events over a longer period of time. URL to all events: The URL to a page listing all of your events, for example one using the Events: Grid or Events: List templates. Will be used to display a link to the page next to the widget title. Leave empty to disable. Calendar: The URL to a page using the one of the Events: Calendar or Google Calendar page templates. The link to this page is displayed below the list of events. The WPlook Flickr widget displays the latest images from your Flickr feed. Flickr RSS: The RSS URL of the public feed you want to display. To get this, log into Flickr, Go to You → Photostream, choose Edit from the More menu, scroll to the bottom of the page and right click Latest close to “Subscribe to [your name]’s photostream”. Click Copy Link or Copy Link Address, depending on your browser. Paste this URL into this field in the widget options. Number of thumbs: The number of images to display in this widget, sorted by date, with the most recent images displayed first. The WPlook Gallery widget displays your latest gallery posts, together with a link to a page containing a list of all galleries. Category: The category from which the gallery posts will be displayed. Number of galleries: The number of gallery posts to display in this widget, sorted by date, with the most recent gallery displayed first. URL to all galleries: The URL to a page listing all of your galleries, for example one using the Gallery Grid page template. Will be used to display a link to the page next to the widget title. Leave empty to disable. The WPlook Instagram widgets displays the latest posts from a chosen Instagram account. The WPlook Instagram widget displayed in the site footer. Subtitle: A short piece of text, seen below the title in the above image. Instagram username: The username of the Instagram account you want to display. Image limit: How many images to display in this widget, with the latest images coming first. Follow button text: The text displayed on the button linking to the Instagram account in this widget. Leave blank to hide the button. This widget allows you to display latest donations to either all causes or a selected cause, based on existing Pledges information from PayPal and Stripe. Description: Custom text, seen below the cause image. Cause: The cause to display information about. Use this widget in the Causes Widget area and select Current cause to display information for the cause currently being displayed. Number of donations: The number of latest donations to display in the widget. Display cause information: Display the title, short description and image of a cause above the latest donations. Display total: Display the total amount of donations for this cause below the latest donations. Display goal: Display the goal for donations for this cause below the latest donations. Display link: Display the link to the single cause page below the latest donations. 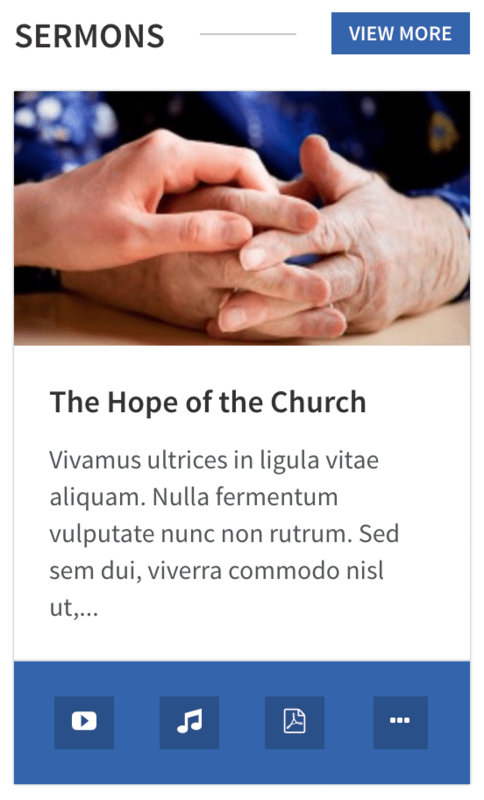 The ministries widget displays a list of recent ministries, with an image, ministry title, and short text for every ministry, with a link to a page listing all ministries at the top of the page. Number of ministries: The number of ministries to display in this widget. Order by: How to order multiple ministries in the widget. Choose Latest to order the ministries by date, with the latest ministry being displayed first, or Random to display different ministries on every page load. URL to all Ministries: The URL to a page listing all of your ministries, for example one using the Ministries List page template. Will be used to display a link to the page next to the widget title. Leave empty to disable. The WPlook Posts widget displays an image, excerpt and a read more link for your posts. Number of Posts: The number of posts to display in this widget. URL to all Posts: A URL for a page where all posts can be viewed – usually your blog page. The WPlook Project widget is used to display a list of projects, each with an image, short text and a link. It also features a link to a page of all projects. Category: The category from which the projects will be displayed. Number of projects: The number of projects to display in this widget. URL to all projects: The URL to a page listing all of your projects, for example one using the Projects Grid or Projects List page templates. Will be used to display a link to the page next to the widget title. Leave empty to disable. The WPlook Quote widget allows you to display a highlighted quote in your sidebar. Title: The title of the widget, seen in a larger font at the top of the widget. Quote: A longer piece of text, seen in the smaller font below the title. The WPlook Sermons widget is used to display a list of sermons, each with an image, short text and a link. It also features a link to a page of all sermons. Category: The category from which the sermons will be displayed. Number of sermons: The number of sermons to display in this widget. URL to all sermons: The URL to a page listing all of your sermons, for example one using the Sermons Grid or Sermons List page templates. Will be used to display a link to the page next to the widget title. Leave empty to disable. 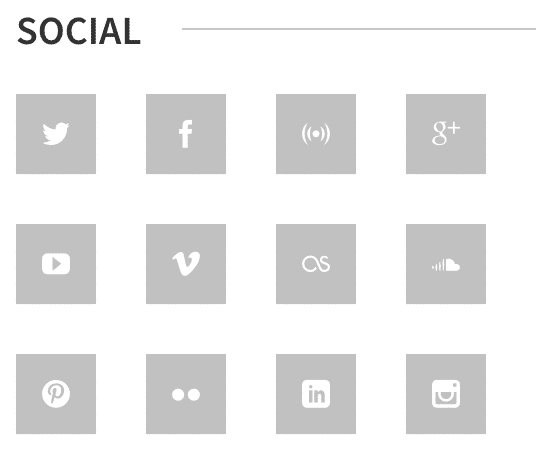 The WPlook Social widget allows you to display a grid of icons linking to your social media accounts. The widget also features a setting for each of the supported social networks. Paste in a URL to your page and a link with an icon will automatically be added to the grid. The WPlook Staff widget is used to display a list of staff, each with an image, short text and a link. It also features a link to a page of all staff. Category: The category from which the staff members will be displayed. Number of candidates: The number of staff members to display in this widget. Order by: How to order multiple staff members in the widget. Choose Latest to order the staff members by addition date, with the latest staff member being displayed first, or Random to display different staff members on every page load. URL to all candidates: The URL to a page listing all of your staff, for example one using the Staff/Team Grid page template. Will be used to display a link to the page next to the widget title. Leave empty to disable.